EastEnders star Nitin Ganatra has revealed that he wants Laurie Brett to make another return to the soap. Brett was seen briefly reprising her role as Jane Beale earlier this month, but she is currently still a cast member on fellow BBC One show Waterloo Road. "Their relationship had the forbidden element that kept audiences hooked. If Jane returned to Walford, what would the dynamic be now? That's a tricky one to decide!" Masood's current storyline sees him on a downward spiral following recent setbacks in his life. Ganatra admitted that he is currently unsure of how long the plot will run for. He said: "Masood is one of the nice guys, so you're very limited with how far you can take him. But our new boss Dominic [Treadwell-Collins] has said yes to taking Masood down a darker path and seeing where it goes. That's the exciting thing about EastEnders now - we're all in the dark about the twists that the storylines will take, which is kind of nice! "It's been great to film and we have some brilliant scenes coming up. I've been doing a lot of drunk acting, and for someone like Masood who hasn't had a drink in 25 years, it's a hard one to play. I'm not sure if I've succeeded yet!" EastEnders star Nitin Ganatra has promised that his character Masood Ahmed's ongoing troubles will be a long-running storyline. Masood has headed down a darker path in recent episodes by gambling, drinking alcohol and even stealing his son Tamwar's university fund. Next week, viewers will see Masood appear to make steps towards turning his life around again when his daughter Shabnam (Rakhee Thakrar) intervenes, but Ganatra has warned that everything may not be as it seems. He told Soaplife: "EastEnders have given him a downward spiral that lasts for a good length of time. Shabnam is home and she is going to try to clean him up a little bit. "But just because he washes his hair, has a shave and changes his underwear doesn't mean that he is okay. When somebody is that low, you don't expect them to recover in the next episode." A broken Masood sits on the curb. Praising the story, he added: "It's nice to play the opposite of the chirpy, cheerful postman. They are really degrading Masood and I think that is revitalising the character. He is evolving." 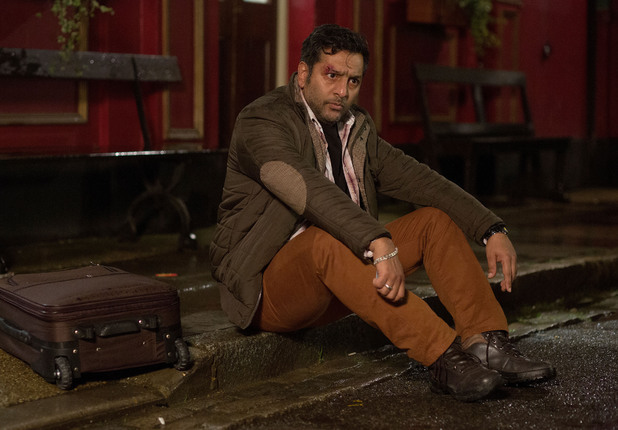 Masood's recent mistakes have followed a tough 12 months for the character, including the breakdown of his long relationship with Zainab and the death of his mother. EastEnders continues tomorrow (January 30) at 7.30pm on BBC One. EastEnders star Nitin Ganatra has told Digital Spy that the show's bosses are lining up some big autumn storylines for the Masood family. The actor, who plays Masood Ahmed, confirmed that he will have a busier filming schedule towards the end of the summer. While firm plans for the family are currently under wraps, show chiefs have previously teased that Masood's daughter Shabnam is hiding a big secret. Ganatra told Digital Spy "I still don't know what the secret is! We were told a while ago that there was a secret, but then it went very, very quiet. Then recently someone mentioned the secret, so I think it's back on the cards. "I think with the Masoods, it's going to start taking place in September. We'll start filming round about August and then the storylines will kick in around September time, leading up to Christmas." Ganatra also said that he hopes viewers haven't seen the last of Masood's darker side, which was explored on screen at the beginning of the year. He explained: "I really hope that they continue to explore the darker Masood. It was nice to play. The character was getting a little bit boring for me to play - it was the same old reasonable guy. "It was a suggestion that I came up with - that he'd go down a darker path because he's a man struggling with his life falling apart. It was really well-received. The writers loved it and they wrote some fantastic dialogue for it. Rumour has it that we're going to carry on building on that. Fingers crossed." Ganatra also ruled out a reunion for Masood and Carol Jackson following David Wicks's departure from the show. He laughed: "Masood lost Carol to her ex, he lost Jane to her ex and he lost Zainab to her ex. I'm kind of done with the 'going back to the ex' storyline - it's become a pattern! The problem is, if they have a happy relationship, there's not really much of a story to tell." EastEnders' Nitin Ganatra has said that there will be fireworks ahead for Masood and his family, as the relationship between himself and his daughter Shabnam is explored. Shabnam ( Rakhee Thakrar) returned to screens in January, but has experienced quieter times on Albert Square since. Speaking to Bang Showbiz, Ganatra, who plays Masood, said: "[There are] lots of father-daughter fireworks coming up. "Shabnam has come back from Pakistan with a very head-strong attitude and it's kind of put the laid-back Masood on his back foot." "She's a feisty young lady who tells her dad what to do. I think the storylines developing at the moment will kind of be exploring that relationship between father and daughter and switching the roles a little bit hopefully." Ganatra also said that viewers would see a darker side to Masood as the plot develops. He said: "We might see a darker Masood, a bit more possessive with his daughter than you usually expect Masood to be. "So they're going to be exploring this, we might see a wilder side to Shabnam, so everything might get flipped on its head." Thakrar recently told Digital Spy that the show will delve deeper into exploring Shabnam in a new storyline. Executive producer Dominic Treadwell-Collins also said that the character was one to watch. Masood Ahmed's relationship with his daughter Shabnam comes under serious strain on EastEnders next week as he continues to defy her wishes. Desperate to have his granddaughter in his life, Masood decides to pay a visit to the absent child and even betrays Shabnam's trust by exposing her lies to Shirley Carter. Here, Nitin Ganatra - who plays Masood - reveals his take on what's to come in the emotional storyline. How would you describe Shabnam and Masood's relationship at this point? "There's an intense amount of father and daughter love between Shabnam and Masood - she is his princess. He really cares for her and I don't think she ever stops being daddy's princess. "There is tension between them as well where she wants to change him. She wants to straighten Masood out a little bit, and because she is so opinionated and stubborn, she's his anchor so to speak. At the same time, Masood drives her mad because he can be a bit reckless and a bit naughty." How has Shabnam revealing she has a daughter affected their relationship? "For Masood it is the ultimate betrayal. Masood is a real family man. I think two years ago we talked about Masood in deep crisis, simply because his family didn't need him anymore. His wife didn't need him, Tamwar was all married and grown up, Syed was married and off in Birmingham and Shabnam wasn't there at the time. "He is a man that exists through being needed and he is a family man. Masood doesn't like being alone - he likes to be around company and hustle and bustle and people who want him. "So overall, it is the ultimate betrayal - given that he is a family man and kids and family are very important to him. They're also very important in the Asian community. We all come from extended families, your house is always busy with people, so to find out Shabnam had a baby without telling him leads to all sorts of complicated thoughts for Masood. He is a grandfather of a child and he should be looking after his granddaughter." How does Masood feel about Kush and Shabnam's engagement? "He is quite happy with the engagement, given that he and Kush get along really well. They are like best buddies! I think originally when they talked about Kush, he was almost like a younger Masood. When Masood was young, he would have been very similar to Kush - a cockney geezer, working on a market stall, ducking and diving! He really likes him. The thing is though, you don't hurt Masood's daughter, and he would hate Kush if he hurt Shabnam in any way." Why does Masood decide to go and find his granddaughter? "Masood can't let go of the idea that he has a granddaughter out there somewhere who doesn't know that she has got a loving family which she can go to. It would be wrong of Masood to just ignore that. Shabnam has her own reasons, but for Masood it's all about family, which is a very EastEnders thing - EastEnders is all about family and community. He wants to find this little girl and say, 'Welcome to the Masoods'." What's going through Masood's mind when he sees Jade, who he believes to be his granddaughter? "I think he adores her! Jane stops him from getting out the car, but it breaks his heart a little bit - as it would if you were a granddad. There is a little girl here who doesn't know where she is from - she might be okay but that's beside the point." Do you think Masood is angry at Shabnam when she later reiterates that she wants nothing to do with Jade? "Oh yeah, Masood is really trying to do his best to get Shabnam to come to terms with it, but she is not having it and ultimately he has to respect that. But then it puts him in a very difficult place because he genuinely wants to be in this child's life and family is everything to him." Why does Masood then give Jade's address to Shirley? "I think there is a lot going on in his mind - he wants to get to his granddaughter and he probably sees it as his only option." Do you think this is something Shabnam and Masood can move on from? We'll also see Carmel and Masood grow closer, won't we? "Yes, it's nice for Masood to have someone to talk to. I'm not sure quite where it's going to go, but Dom likes the chemistry between the characters, so who knows where they might end up? "Bonnie Langford is a lot of fun to work with and has fitted into the Masood household brilliantly. She is very funny, all the joking around, but very professional as well." EastEnders star Nitin Ganatra has hinted at a "very upsetting" storyline involving the Masoods. The actor, who plays Masood Ahmed on the BBC One soap, said that the upcoming plot involving the family will be "sad - but full of heart". "We're building up to something big that will be on screen in a couple of months' time. It's the first time I've ever got weepy reading a script and it gives me goose pimples just talking about it," he told Radio Times. "It's a very upsetting storyline. Really sad - but full of heart." The actor went on to reveal that it will be in the run-up to Kush Kazemi and Shabnam Masood's wedding that problems for the family start to occur. He said: "It's going to be a fun build-up to the wedding. There are rumours of Carmel and Masood getting it on and there's a lot of comedy. And then we're going to pull the rug out from under you. "The aftermath of this will run all the way up to Christmas and I'm really excited at the thought of flexing my acting muscles." It sounds like something tragic will happen. Maybe the death of Roya/Jade? I hope not. Last edited by maidmarian; 04-06-2015 at 14:51. Last edited by maidmarian; 04-06-2015 at 14:29.